The new Mall lights allow students to see properly at night, providing safety. Photo by Adam Cvik. New LED lights shine brightly on the paths between academic buildings, residence halls and the Atherton Mall. Students are no longer in the dark. 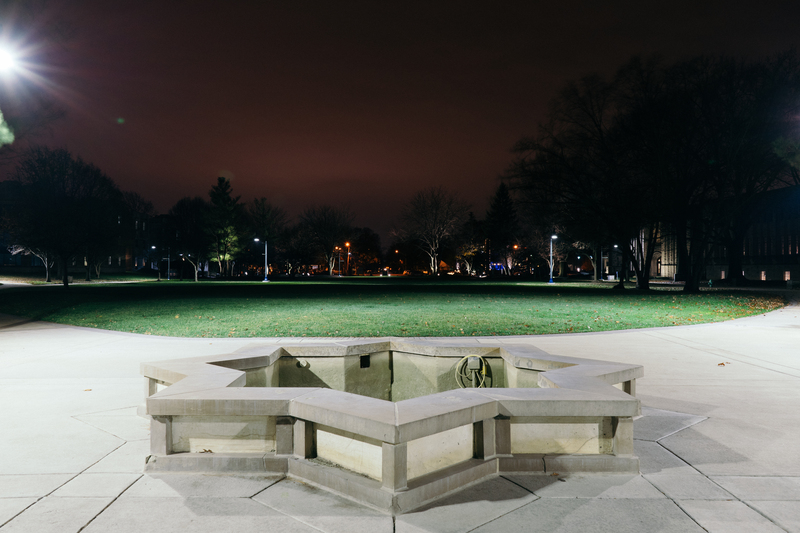 The installments are part of an effort by Butler University’s Office of Operations, BUPD and SGA to increase student safety on campus and improve the standard of lights. Installation of a dozen hooded light poles around the main quad began at the end of summer, and all lights should be completed and working by finals week. Some areas of campus, such as near Atherton Mall, were not lit at all. Lights would shine directly at trees rather than the pathways. Melissa Evans is a sophomore psychology and critical communication and media studies double major. She often walks through campus at night to attend club meetings and study at Starbucks. The Student Initiatives Board of SGA includes an operations committee. The group goes on a night walk once a semester with BUPD, the director of operations, and Butler facilities to identify any safety issues. Senior biology major Colton Junod is vice president of SGA’s Student Initiatives Board. Some recent safety concerns include armed robberies and reported gunshots near and on campus. Amanda Doenges, director of engineering and administration, began studying the light safety issues around a year ago. The original lights were owned by Indianapolis Power and Light, and Butler would pay a monthly rental rate to use them. Now, there is a mixture of Indianapolis-owned and Butler-owned lights throughout campus. The older lights are present near Fairbanks, Jordan Hall, the Pharmacy Building and behind Holcomb Building. The new lights, located on Atherton Mall, Sunset Avenue, Lake Road (between the bell tower and the HRC) and near Fairview House are owned by Butler. “Ideally, we’d love to replace all the existing lights on campus to our new standard,” Doenges said. Doenges said Operations and Facilities are looking to improve other areas on campus. They are currently receiving an estimated price regarding the addition of the new lights near Jordan Hall and the wooded area between Gallahue Hall and Holcomb. “We want students to be aware that we are working on them [lighting issues], and the administration is hearing our concerns and working towards those as well,” Junod said. Evans, a student, said she would like better lighting near parking lots and pathways students walk through every day. Evans referenced the area between the Alpha Phi sorority house and Fairbanks as an example. “Overall, I’d like them to aim the lights at the sidewalk, so I know where I’m going at night,” she said. Doenges said they are looking to improve and extend the sidewalk that follows Hampton Drive up to a parking lot near Fairbanks in the future. The sidewalk currently dead ends shortly after the Alpha Phi house, and students must walk on the road in either direction, which continues on Hampton or toward Fairbanks. The new lights are also environmentally friendly because they reduce light pollution in the area. The lights have a hooded top, so light shines directly down rather than into the sky. Doenges said this helps the Holcomb Observatory to efficiently survey the sky. The lights are dark-sky compliant, which means they do not add more light pollution in the area. Junod said students should reach out to their SGA senator or any member of SGA regarding future safety problems.